Desperation causes the Athsheans, led by Selver, to retaliate against their captors, abandoning their strictures against violence. But in defending their lives, they have endangered the very foundations of their society. For every blow against the invaders is a blow to the humanity of the Athsheans. And once the killing starts there is no turning back. 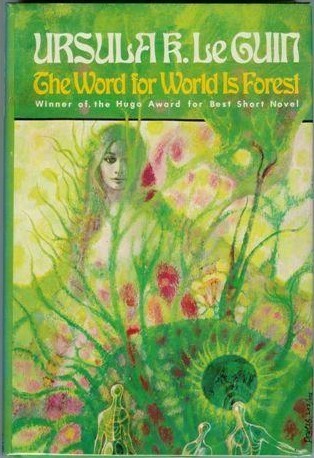 Set several centuries in the future, and part of Le Guin’s Hainish Cycle, The Word for World is Forest has been seen a response to the role of the United States in the Vietnam War. 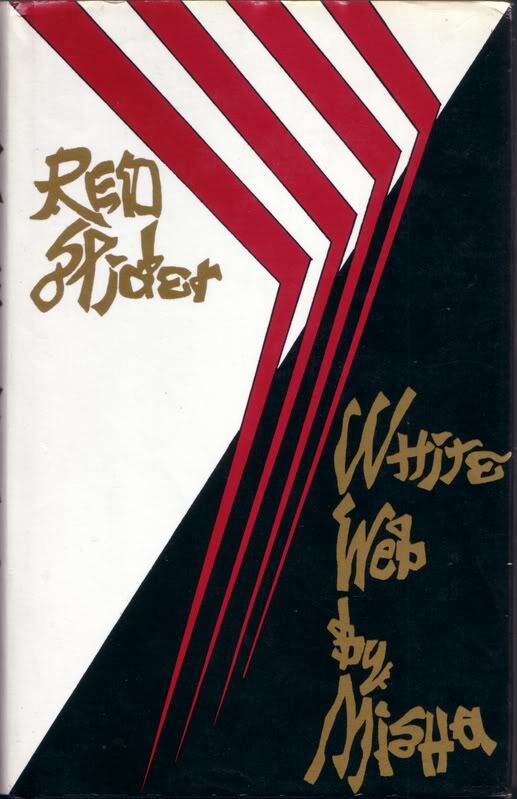 Maybe it was at the time of writing, but I consider this book to be particularly relevant to our own actions today regarding the environment, the destruction of our planet’s natural resources and ‘assimilation’ of indigenous peoples. Certainly that was the theme that struck a chord with me and left a lasting impression. Men from Earth have arrived on the planet Athshe, renamed it New Tahiti, and are in the process of logging the abundant forest, sending the valuable timber back to a homeworld which has suffered environmental destruction. The indigenous population are referred to by many as “creechies” and used as forced labour. The arrogance of the humans is personified in the pivotal character, Captain Davidson, whose point of view opens the book and sets the scene for the explosive events that follow. The native Athsheans – while sharing similar origins as humans, being ‘seeded’ millions of years previously by the Hain – are small, green-furred and live in natural harmony with their world. They have a matriarchal society, a culture of lucid dreaming and, prior to the arrival of humans, have no history of violence. Although the behaviour of the colonists, or ‘yumens’ as they call them, is of concern to the Athsheans, the idea of fighting back against the destruction and oppression is an alien concept to them. They don’t understand the yumens and consider them to be backward and insane. Their world, where the word for ‘world’ is the same as that for ‘forest’ is described in rich detail and shows Le Guin’s talent for worldbuilding. When contrasted with the society the colonisers have created, Athshe is indeed a utopia. Although I think that The Word for World is Forest is not one of Ursula Le Guin’s best books, it is well worth the few hours it will take to read. It lacks some of the depth seen in other novels such as The Left Hand of Darkness or The Dispossessed in my view; however, I found the character of Davidson compelling. While he was the archetypal colonist; self-righteous, overtly oppressive and dismissive of anyone not like himself, his inner dialogue revealed an almost sociopathic personality. He reminded me of Colonel Kurtz in Apocalypse Now, slowly going mad in an unfamiliar environment. On the other hand, Selver, his Athshean adversary and nemesis, was a more thoughtful and introspective character who took no pleasure in becoming the first of his kind to kill and murder. He led a bloody and ruthless revolt but lost a vital part of himself in the process. Both men are irrevocably changed by the events in which they played central roles. What has stayed with me is the environmental thrust of The Word for World is Forest. Men (and the human colonisers are all male) arrive on Athshe to plunder its forests with no consideration for the native inhabitants or the consequences of removing the trees from the land. It sounds very familiar to us today, with the Amazonian and Indonesian rainforests being cut down and replaced with soya and palm oil plantations. But we do not have a New Tahiti to exploit. Ursula Le Guin has described a lush and fertile world, one where the trees are the lifeforce of the land and the inhabitants recognise this. The Athshean society lives in harmony with its environment, respecting the land and the creatures that live around them. Le Guin makes a very interesting point… that the word for world in the Athshean language is forest, whereas the word for world in ours is earth. Born in 1929 in Colorado, Sheri S. Tepper did not begin to receive much notice or acclaim until she retired from her position as Director of Rocky Mountain Planned Parenthood in the early nineteen-eighties. Before her retirement, she had published some short children’s stories. Her first full length published works were the True Game YA fantasy series. 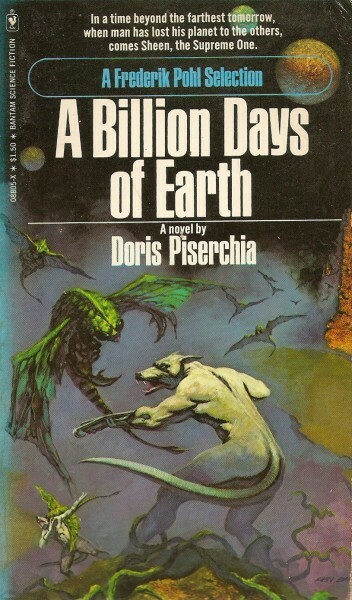 After her retirement in 1986 she published several science fiction novels. 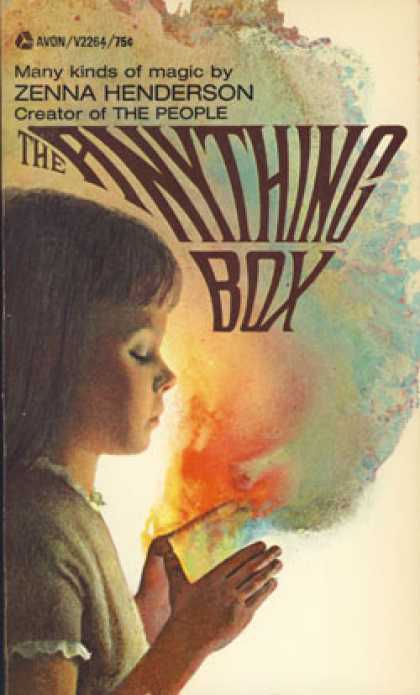 She has also published horror and mysteries under several pseudonyms including E.E. Horlak and B.J. Oliphant. 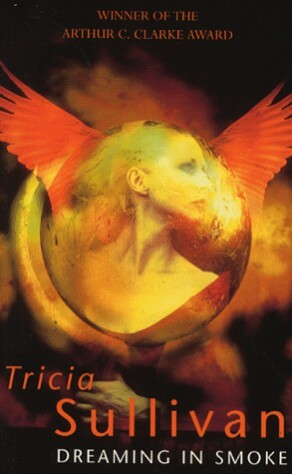 In 1991 she won the Locus magazine Best Fantasy Novel for Beauty. Tepper is best known for her eco-feminist tales that are often a mix of both fantasy and science fiction, putting her in the socio-political category of SF. 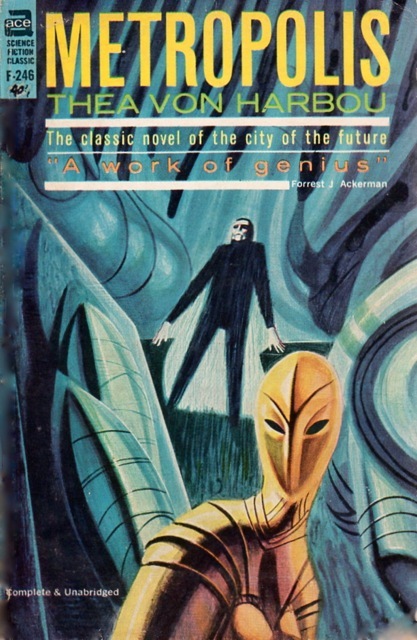 In the 1998 Locus Magazine interview entitled Sheri S. Tepper, Speaking To the Universe she said “To me, fantasy has always been the genre of escape, science fiction the genre of ideas. So if you can escape and have a little idea as well, maybe you have some kind of a cross-breed between the two.” This philosophy is borne out by her writing style. Published in 1989 Grass is the first in the Arbai trilogy. It was both a Hugo and Locus award nominee. The story centres on the character of Marjory Yrarier né Westriding and her family’s settlement on the mysterious planet of Grass. Marjory and her husband Rigo are from Earth. They are ‘Old Catholics’. The society within which they live is ruled by the laws and the religion known as Sanctity, a mix of dogmatic Christianity and science worship. Earth is crowded and deprived of resources. Its people live under strict procreation laws and its children are often forced into servitude among the sanctified from which the only escape is a penal colony or service among the Green Brothers upon Grass. Humanity has spread throughout the galaxy; however, growth has long since been stagnant due to economic depression, the stifling of human expansion by Sanctuary, and a plague that seems to affect every world that man inhabits other than Grass. In the hopes that they can find the scientific answer to plague, Rigo is sent as the Ambassador at the behest of his uncle who is the head of Sanctity. Along with Marjory and their two teenage children they journey to this little known outpost. Grass is a planet made almost entirely of grasses; with the exception of a few swamp forests, small copses of trees, and outcropping of rocks there are no other topographical landmarks. The ‘bons’ are the ruling class. In their huge estates known as ‘estancias’ they spend most of their time at the hunt. With native fauna consisting of the Hippae as the mounts, a terrible almost dinosaur like creature, those only known as hounds who are similar to the Hippae but smaller and usually run on all fours, and the foxen who are barely glimpsed by most humans. Though the bons consider themselves the rulers of Grass they produce little from their great estates and are blissfully unaware of the thriving commerce that takes places in ‘Commons’, the large settlement of workers and merchants within which the space port is located. The bons live in a by-gone era. With little education and almost no knowledge of technological developments their time is spent either at the hunt – which cycles through each estancia on a regular basis – or at political scheming among themselves. They are distrustful of strangers and outsiders. Marjory and Rigo must try to ingratiate themselves to this close-knit family based hierarchy so that they might discover the secrets of plague immunity. Through their own love of riding they try to develop a rapport with the bons. It isn’t until they witness a hunt for themselves are they made painfully aware of the sinister manipulations of the Hippae and their malevolent hold over the bons. When their daughter mysteriously disappears on a hunt Marjory and Rigo are thrown into conflict with the bons, but it is Marjory who seeks to know the darkest secrets of the Hippae. With aid from the wise Brother Mainoa – a Green Brother archaeologist working on the ruins left by the extinct Arbai – she will ultimately discover how and why the Hippae control the world of Grass. She will also discover how the Arbai, who once thrived on every world now inhabited by humans, suddenly became extinct. Grass itself is a beautiful if intimidating place. With its vast prairies of grass in different lengths, widths and colours, the landscape is not an endless wheat field, but an array of sculpted planes that shift and change with the seasons. The people of Grass are both in love with the planet and yet live in constant fear of the dangers that lurk beyond their seeing. Man has conquered many places, but he cannot conquer Grass. In many ways this story is far more fantasy than science fiction. The descriptions of the people and the places are almost Steampunk. The world of grass is populated by ornate flying machines and air balloons. There is a distinctly Victorian feel to the dress, attitudes and the grand homes of the bons. Science is a thing that is very far away. The Green Brothers—a sect of the Sanctified living on Grass—live in a monastery made entirely of grasses. Beyond God and the harvesting of grass their only occupation is the archaeological pursuits of the Arbai city. Technology is used sparingly. It is not machines that will thwart the machinations of the Hippae but cunning. Tepper writes an entirely engaging mystery and adventure full of metaphor. On the one hand it is a treatise on human expansion and colonisation, not among the stars but on our own planet. Instead of man dominating the landscape, the landscape dominates man. The animals are no longer the victim, but the persecutor. It is also a story about classism. The bons look down on pretty much everyone else. They tolerate the ‘commoners’ more than they do Marjory and her family because the Yrariers are intruders, or ‘fragras’ as they are called. However, the bons power is superficial. The commoners have a thriving community and do very well in trade with the rest of human civilization. They are not as ignorant of technology and medicine as the bons are. Though the bons see them only as servants, the commoners are in fact far freer to seek their own happiness than their masters. There are many threads woven in and out of the story beyond the larger concepts of ecology, human expansion, and classism. This story is also about evolution both in the natural world and in human civilisation. It is about the place of religion and belief in a society full of scientific advancement, and a world filled with natural forces beyond the control and remit of religious institutions, or power. Tepper uses her knowledge and experience – no doubt gained in her many years at Rocky Mountain Planned Parenthood – of class struggle, poverty and religion to weave a well-rounded, if sometimes disturbing, view of a possible future. The human society we enter through the characters in the story is dystopian in its restrictive and punitive view of itself. Yet the beautiful world of Grass is as equally dystopian; though it promises freedom to those who wish to rise from the oppression of Sanctity, they must pay a terrible price for that freedom by sacrificing either their will or their lives to the Hippae. What comes across most acutely is man’s ability to learn, to share, and to adapt. Grass is a forbidding place because of the sinister secret it hides, yet men have come and carved from it their own society despite the treachery of nature all around them. Within the story, Marjory finds herself as a person separate from her husband and her children. She finds the truth through the darkness and guides others toward a collaborative and sustainable future. This is not a dark tale of struggle and ultimate self-destruction, or apocalyptic annihilation. It is not only a tale of warning against the human presumption over the natural world and over each other; it is, in fact, a story of hope. It is about man’s ability to change, to ascend and become something better. Tepper is one of the great minds of socio-political science fiction. She is also a consummate story-teller. Her descriptive style is infused with thought-provoking narrative. Her characters are well-rounded and full of conflict and personal struggle. Her story is full of action and is well paced. There is both beauty and horror in every aspect of the universe she has devised. Though she sometimes takes some unusual liberties with narrative style, it is amazing how she can make certain technical flaws work where lesser authors would fail. In the family tree of great women writers of Science Fiction, Sheri S. Tepper is undoubtedly a descendant of Mary Shelly. This review originally appeared on Beyond Fiction. See also this SF Mistressworks review of Grass.